Overall passenger satisfaction with North American airports has reached an all-time high, as airports of every size have found creative ways to address the challenges of constant construction projects and increased passenger capacity demand. Thatâ€™s the finding of the J.D. 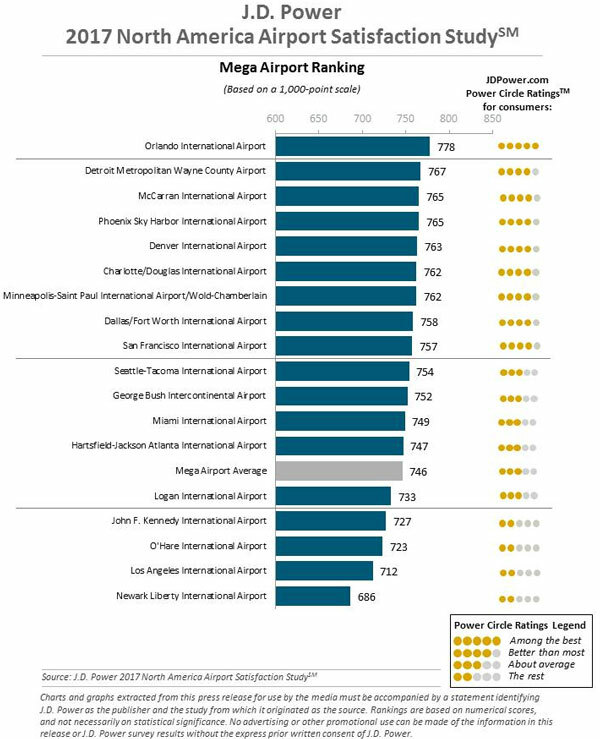 Power 2017 North America Airport Satisfaction Study. Overall satisfaction reaches all-time high: Overall customer satisfaction scores have reached an all-time high of 749 (on a 1,000-point scale), which is up 18 points from last yearâ€™s all-time high. Improvement is driven primarily by a 25-point increase in satisfaction with security check, thanks largely to fewer TSA staffing issues this year, and gains in two factors: check-in/baggage check (+19 points) and food, beverage, and retail (+15 points). Self-service bag-check kiosks and other bag-tagging technologies have played a significant role in improving the baggage check process. Tech investment helps overcome logistical hurdles: With nearly every airport in the country dealing with challenges of high passenger capacity and ongoing construction projects to address increased demand, technology is helping to directly address these issues. For example, Sacramento International Airport has developed a smartphone app that tells travelers where they can find a parking spot, and virtually every airport in the country has invested heavily in improving phone-charging stations and internet access in their terminals. Dogs, horses and pigs! Oh, my! : Many airports have also found success in improving customer satisfaction through creative use of high-touch traveler outreach initiatives. Phoenix Sky Harbor, for example, deploys a team of therapy dogs for passengers to pet while they wait to board; San Francisco International features a pet therapy pig that roams the terminal looking for pets and selfies; and Cincinnati/Northern Kentucky Airport has more than 30 stress-relieving ponies on staff with which travelers can interact. Big city construction projects remain obstacle to satisfaction: Despite the most creative efforts to address traveler frustration, major city airports that are in the thick of massive construction effortsâ€”notably Newark Liberty, LaGuardia, Los Angeles International and Chicago Oâ€™Hareâ€”are still fighting the headwinds of traveler disruption and access challenges that are handicapping their overall satisfaction scores. Orlando International Airport ranks highest in satisfaction among mega airports, with a score of 778. 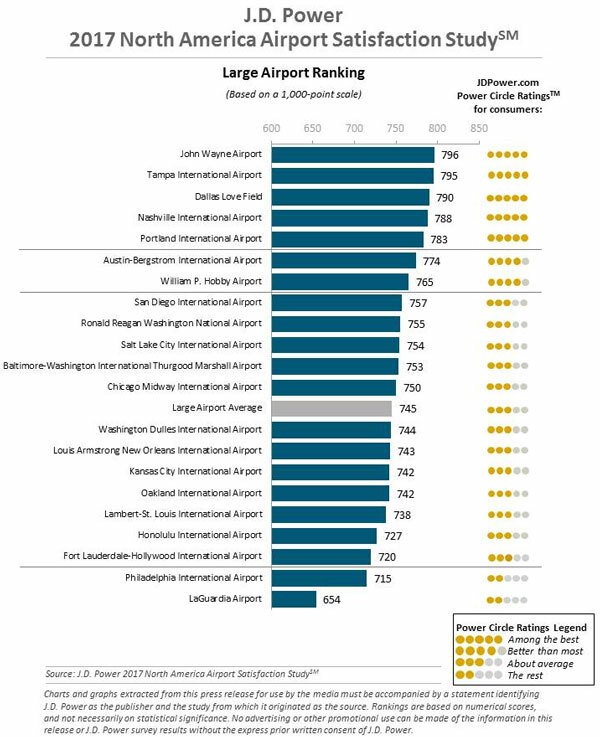 Detroit Metropolitan Wayne County Airport (767) ranks second, and McCarran International Airport (765) ranks third. John Wayne Airport (in Orange County, Calif.) ranks highest among large airports, with a score of 796. Tampa International Airport (795) ranks second, and Dallas Love Field (790) ranks third. Sacramento International Airport ranks highest among medium airports, with a score of 810. 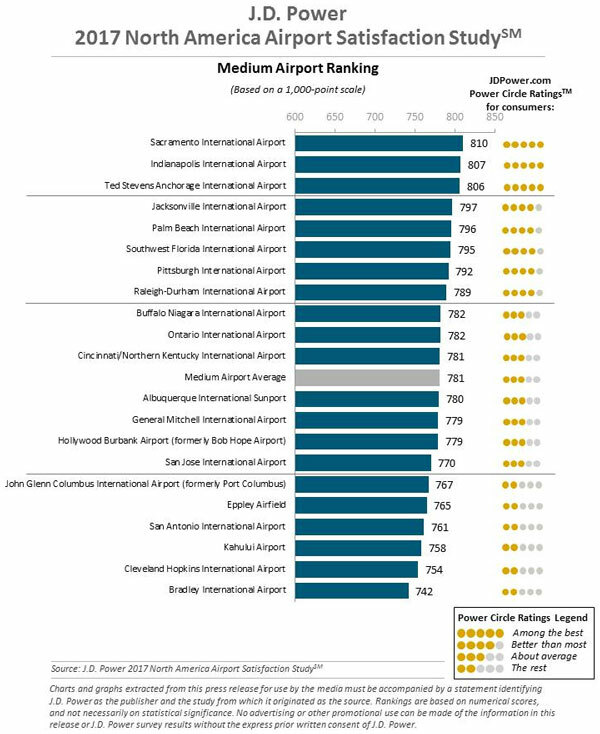 Indianapolis International Airport (807) ranks second, and Ted Stevens Anchorage International Airport (806) ranks third. The 2017 North America Airport Satisfaction Study measures overall traveler satisfaction with mega, large, and medium North American airports by examining six factors (in order of importance): terminal facilities; airport accessibility; security check; baggage claim; check-in/baggage check; food, beverage and retail. Now in its 12th year, the study is based on responses from 34,695 North American travelers who traveled through at least one domestic airport with both departure and arrival experiences (including connecting airports) during the past three months. Travelers evaluated either a departing or arriving airport from their round-trip experience. The study was fielded from January through August 2017. Copyright 2017 J.D. Power. All rights reserved. From http://www.jdpower.com.